The last day of the year is a good time for reflection. I think I should explain in more detail why I started this blog. Firstly, I notice that people of my age group or older like to talk about the past. Whenever, my friends or relatives get together, at Chinese New Year gatherings, or dinners or even funerals, they like to exchange stories about the past. 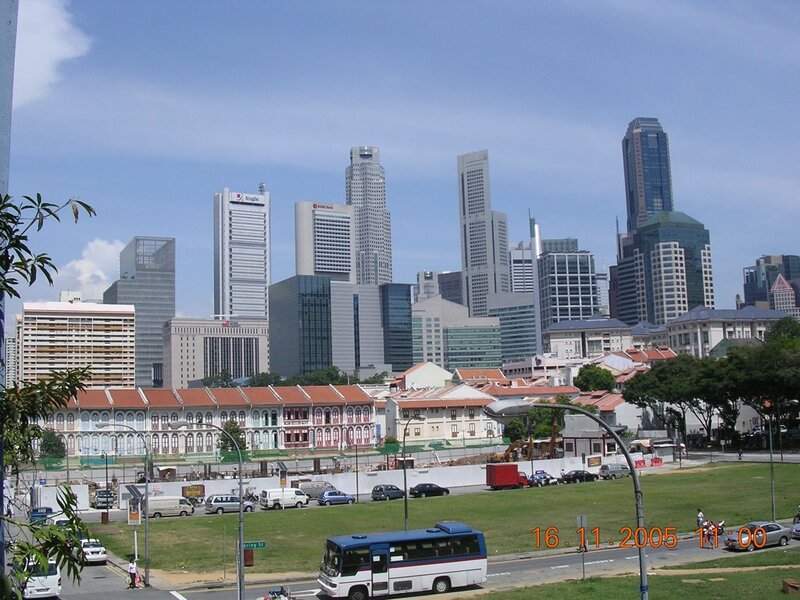 The reason of course, is that Singapore, especially the physical landscape, has changed a lot during our lifetime. 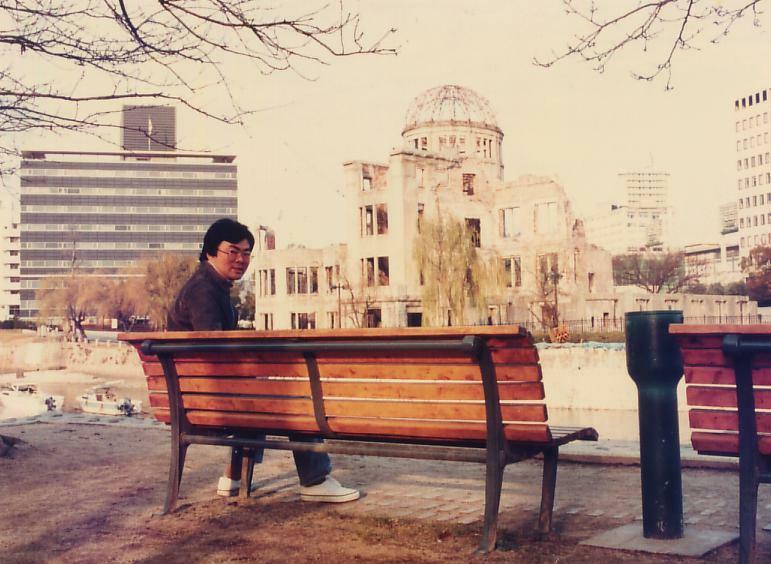 There are very few places that have not changed during the past 30 years. Many of the places that I saw during my army days in the early 1970’s for example, like the kampongs in Jurong, Bt Batok, Marsiling, Hong Kah, Tampines and Ponggol have all gone. Therefore, I thought, a blog would be a useful place for people like us to network and exchange stories. It is no different from a kopi-tiam or a void deck really. The second thing I notice is that our children seem to be very ignorant about life back in the old days; and about things of nature in general. 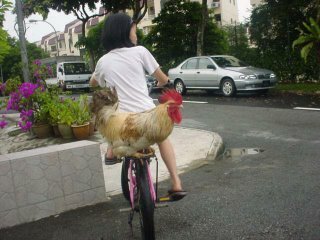 Maybe life in Singapore is too fast-paced nowadays, and they have too many material distractions. Consequently, they miss out on many of the simple pleasures of life. For myself, I make a special effort to tell my children about what life was like when we were kids; and the kind of things we enjoyed as kampong children. For example, I described to my son about how we caught fighting fish from the ponds in our village. 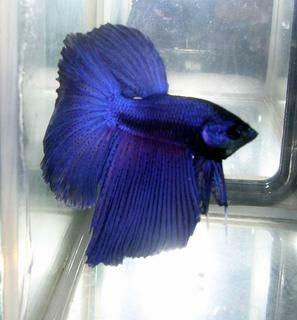 He became very interested, and today he has taken up breeding fighting fish as a hobby. My children also keep many pets in our home, including a cockerel they fondly named Mellow. They are fortunate in a way, because my wife is a Malaysian. 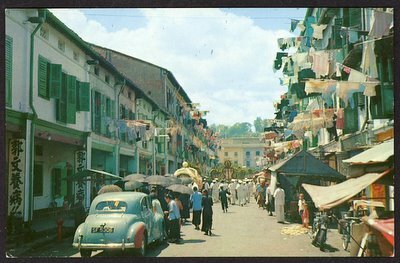 Our frequent trips back to her home town in Ipoh helped to expose my children to life in a less urban environment like Singapore. By the way, do you know what my son calls some of his friends….. ”乡上人“。That’s the opposite of a country bumpkin who is ignorant about modern things. So my second reason for starting this blog is to educate the “乡上“ young people of Singapore. But what triggered off this project was something that happened during a recent trip to Myanmar. On my way back to the airport, I shared the hotel car with a Japanese man who was a frequent visitor to Singapore. 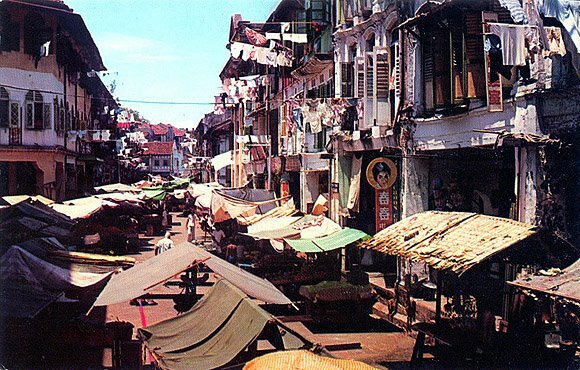 During our conversation, I remarked that Yangon was very much like Singapore during the time when I was young. 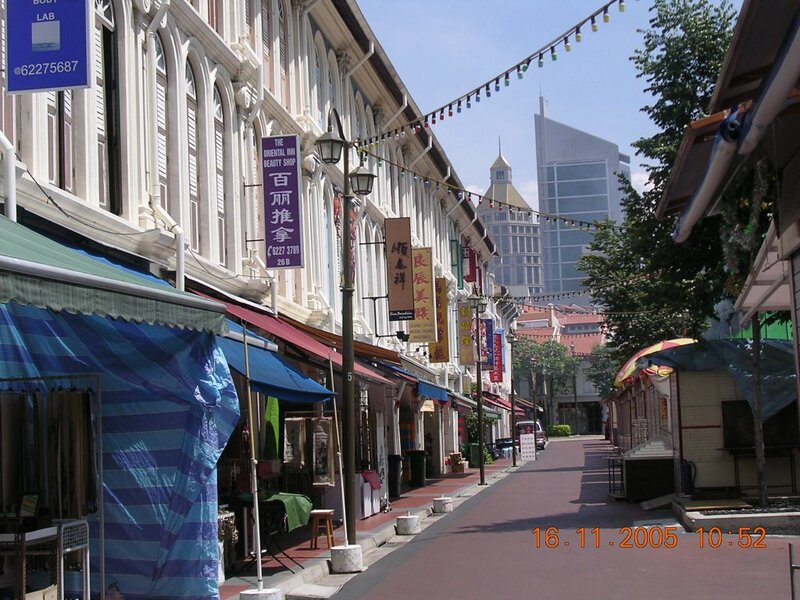 Many of the old British-style buildings resembled those in Singapore, and they have many crowded old buses like our Tay Koh Yat buses of the 60’s. He was surprised and said that Singapore must have changed a lot during the past few decades. Yes, and too fast, I replied. It was then that I decided I should start this blog. I must say that I have been heartened and encouraged by the response that I have received so far. Many of the young people who visited my site actually enjoyed reading about all these old stuff. Initially, I was afraid that they may not like it. Some say that reading a first-person account was quite different from learning from the history books. They say they look forward to hearing more stories in my blog. Another benefit of this project, which I did not realize before was that it helped to promote bonding between the 2 generations. Quite a few young people said that they want to ask their parents to read my articles. Apparently, their parents are quite afraid of the internet and IT; and so they hope to use this blog and my personal example to educate their parents. I will try my best to live up to these young people’s expectations. But of course I cannot do it alone. I intend to get my siblings and friends to chip in. 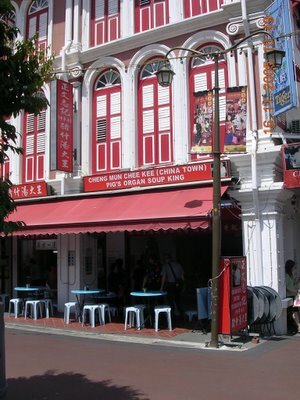 For example, my old friend, Simon Chu Chun Sing has contributed a few very interesting articles about Chinatown and promised to contribute some more. I have extended an invitation to other people of my generation to share their stories here, but so far I have not received any. I don’t know why. I hope it is because they too would like to start their own blogs; then I will have more blogs to read. Right now, other than Victor’s and Chris’ blog (see links section) the blogosphere does seem to be a rather lonely place for people my age. 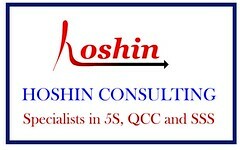 I just came from a visit to Nikholai’s blog website (Blackbox). His articles reminded me of myself when I was young. During my OCS (Officer Cadet School) days in the mid-70’s, someone lent me a war novel entitled The Winds of War by Herman Wouk. I enjoyed it so much that I eagerly awaited the sequel, War and Remembrance. Subsequently, I went on to read most of his books, plus others like Holocaust by Gerald Green, Midway, The Longest Day by Cornelius Ryan, and Malaya Upside Down. I had developed quite an interest in 2nd World War events. 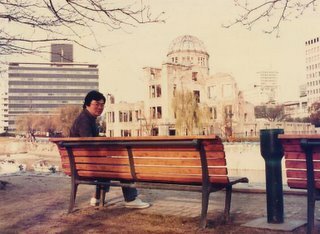 My father was pleasantly surprised when I asked him to tell me about life in Singapore under Japanese occupation. 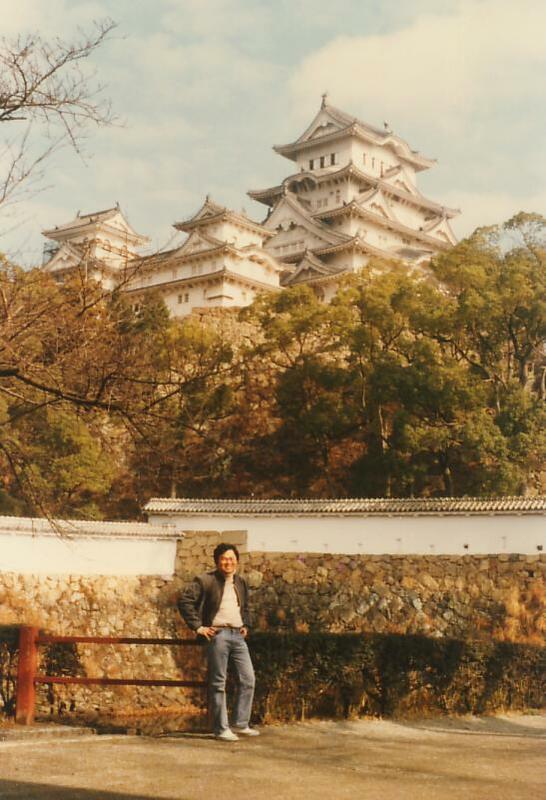 In 1985, when NPB (National Productivity Board) sent a group of us to Japan for three-and-a-half months of training, I was the only weirdo in our group who liked to visit war cemeteries. At the end of our training, while many of our colleagues took the opportunity to visit Korea and Taiwan, I and 2 other colleagues chose to remain in Japan for another week. 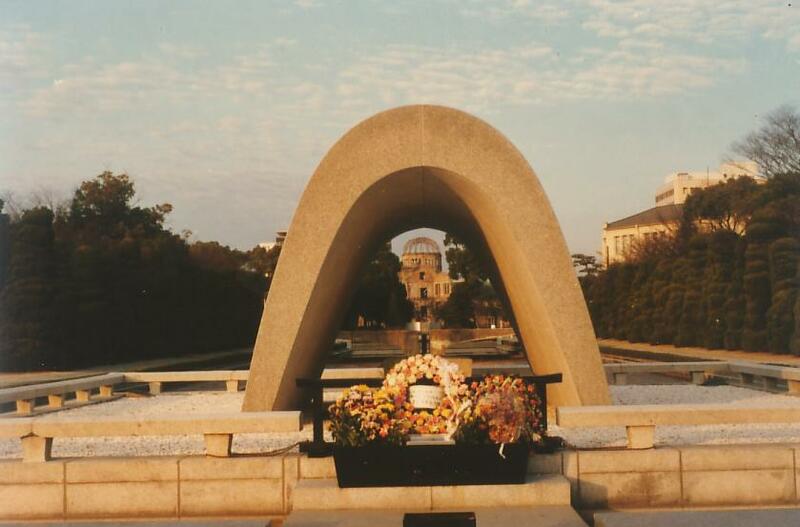 My friends Paul Sum and Low Hock Meng liked Japanese castles and temples whereas I liked war memorials. So I agreed that if they accompanied me to visit the Peace Memorial Park (平和记年公园) in Hiroshima, I would follow them to any other place. 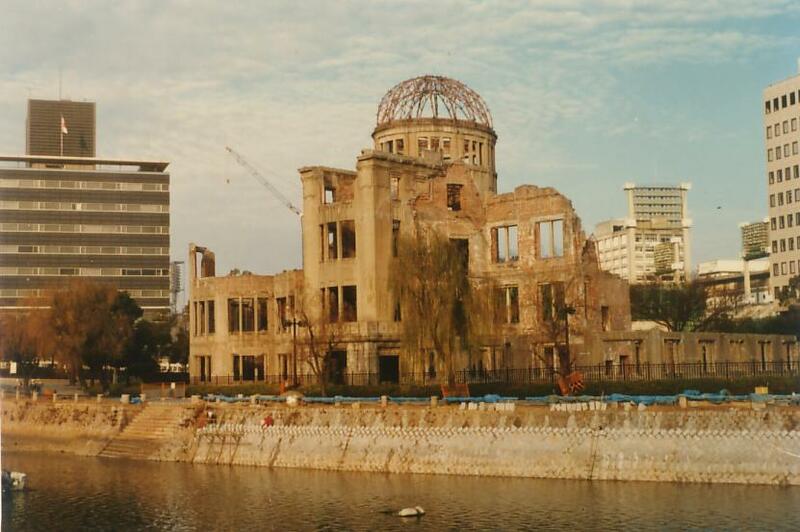 So we left our main luggage at Tokyo International Centre and took a Shinkansen (bullet train) to Hiroshima. 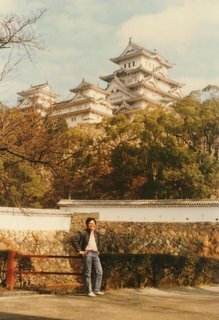 From there, we took the slow trains back to Tokyo, stopping to visit interesting castles and temples along the way; the whole trip lasting 1 week. By the way, I was really impressed by the Japanese bullet trains. 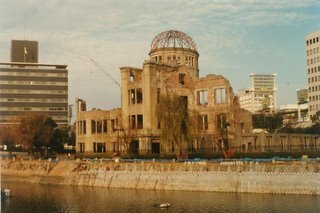 We left Tokyo at 9.00 am and arrived in Hiroshima at around 2.30 in the afternoon. Bear in mind this was 2 decades ago. In comparison, my drive to Ipoh over a similar distance of about 600 km took 8 hours using the North-South Highway (not counting the horrible jam at the Spore immigration on the return trip). 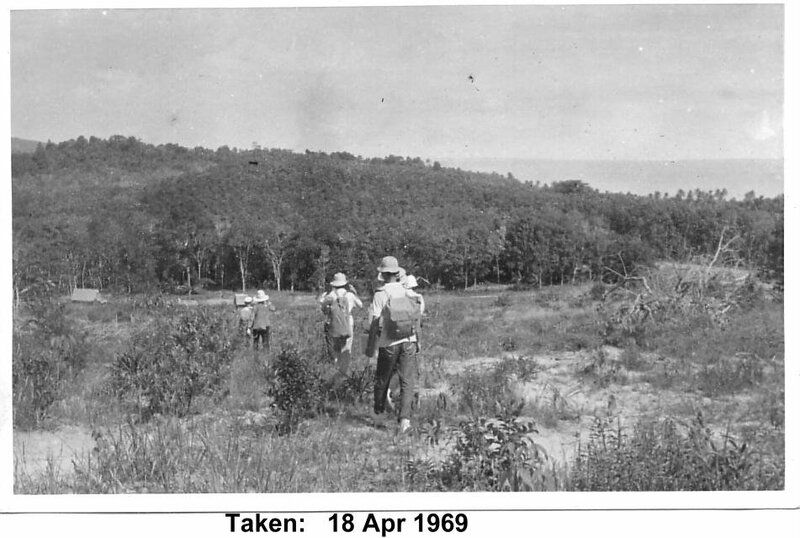 Before they built the NS Highway, it was even worse. How I wish they would build a high-speed railway between Singapore and Ipoh. Last week I took my family on our annual ‘pilgrimage’ to Ipoh. Every year, around Christmas time, 3 families on my wife’s side; 2 from Singapore and 1 from Kuala Lumpur will gather for a ‘reunion’ in my wife’s home town, Ipoh; joining the 2 families that are there. Of course, top on the agenda is to pay respects to my aged mother-in-law. In order not to inconvenience my relatives in Ipoh, I actually bought a small terrace house in Ipoh, right next to my sister-in-law’s house in Pasir Puteh, Ipoh. In case you think I am very rich, please let me declare that the 2,100 sq ft, free-hold, corner terrace house costs only RM105,000, which in 1996 was only about the price of a COE. While we were there, my son, who is crazy about pitcher plants, convinced us to go for a jungle walk up Gunong Brinchang, in the Cameron Highlands to look at the natural flora. 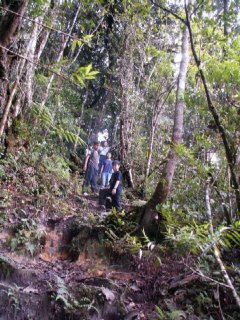 So we spent 1 night in Brinchang, the highest town in Cameron Highlands and set off the following morning for our jungle walk. Of course, only the 2 families from Singapore were crazy enough to take part in the walk, which turned out to be more of a mountain climb. The trek to the start point already tired me out! Altogether, there were 8 of us in the team, comprising my family of 5, plus my sister-in-law and her 2 sons. The oldest member was aged 53 (yours truly) and the youngest only 12. Midway, my sister-in-law found the going too tough and gave up, and decided to stop and wait for us. When we reached about 600 m from the peak, many of us were exhausted and debated whether or not to continue because the path had become more difficult. My 15-year old son, who was the fittest in the group, being a kayaker, wanted to continue. I too did not want to give up so near the destination. Someone suggested that we split; one group to continue, and another to return to where my sister-in-law was waiting. That I absolutely forbade. I didn’t relish the idea of reading newspaper headlines that say; “2 Singapore Families Lost in the Mountains of Cameron Highlands”, or “Minister George Yeo Thanks Malaysian Government for Help in Locating Lost Singapore Families”. In the end, we made the painful decision to turn back, which turned out to be the right decision, because, by the time we reached the main road, I could hardly walk. Although somewhat disappointed, I was quite proud that I made it thus far. What surprised me too, was that the descent turned out to be more difficult than the ascent. This was probably due to my problematic knees, which caused me to lag behind the rest. 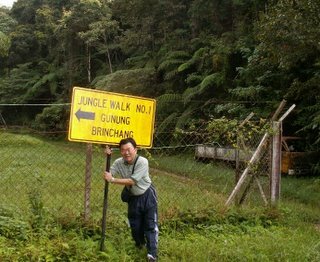 The trip up Gunong Brinchang reminded me of a similar climb up Mt Ophir in 1980 with the Philips Recreational Club. At that time, we camped overnight on top of Mt Ophir. I remember sharing a basha with my colleague and old friend Roger Lee. As he was quite tall, his feet protruded out of the tent, and were exposed to the strong mountain winds. Throughout the night, I could feel him shivering beside me. 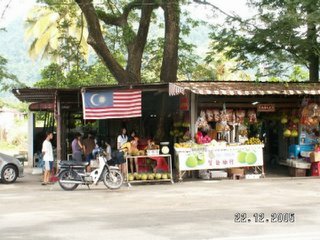 During this trip to Ipoh, we also got to visit a pomelo farm. We met a friendly fruit stall owner, and she happily agreed to bring us to her farm about 3 km away. It was a very good education for the kids. We met a couple of farmers who were still fit and strong despite their age. 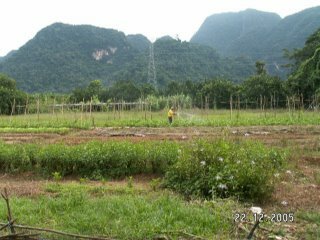 We bought some fresh vegetables from them – when I say fresh, I mean fresh from the ground. This reminded me of my kampong days. It gave me another opportunity to tell my children about life in the kampong. During this trip, I also found time to bond with my children, especially my son. While my wife went shopping with the 2 girls, I accompanied my boy to go fishing. This time around, we managed to catch 4 fishes, as compared to last year when we ‘suffered’ together, because, whilst everyone around us caught lots of fishes, we returned empty-handed. On the last night, we had a great time viewing old family videos; laughing at how cute the children looked a few years ago, and marveling at how much their appearance had changed. I am proud to announce that I was able put my video editing skills to good use. I must say that although my family missed many opportunities to visit other countries due to our annual trips to Ipoh, we always had a wonderful time there. One year, we went to New Zealand instead of Ipoh. After spending a tidy sum, my children’s verdict was that they did not enjoy themselves, and much preferred Ipoh. I guess, they always looked forward to these trips because they loved to play with their cousins. The way I look at it, I should cherish the opportunities while it lasted. It is a matter of time before they grow out of it. Do you know how the special effects like those below were created back in the days of black and white Hong Kong movies, when even the digital calculator did not exist? The special effects of those days were really a far cry from what you see in today’s movies. Nevertheless, it did not stop us from having a good time at the movies. One particular scene from a Journey To The West (西游记 ) movie remains in my mind after more than 40 years. I remember nothing else about this movie except this one scene. Try to picture it. Wukong （孙悟空）and his master and Piggie are peacefully traveling on a raft on a river. Suddenly, a huge (T-rex size) hand emerges from the water behind them to grab them. 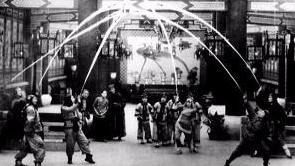 Of course the Chinese action movies those days also had very little bloodshed. The most violent scenes usually involved plunging your sword under the enemy’s armpit! PS – Going for a break. Here’s wishing everyone a blessed Christmas and a Happy New Year. Dear friends, I am glad to report another case of increased father-son bonding as a result of this blog. 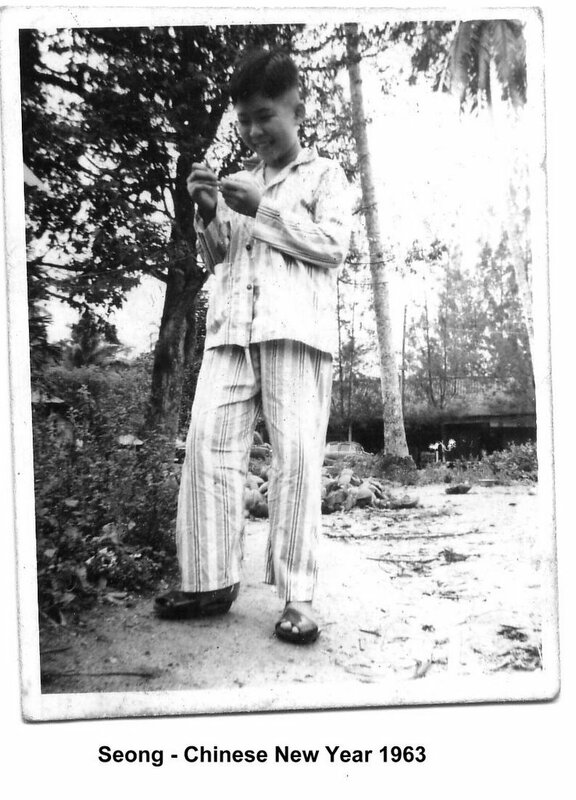 After reading my article about my kampong days, my old friend Chuck, who is in his forties, recalled the toy gun that he and his kampong buddies used to play with. 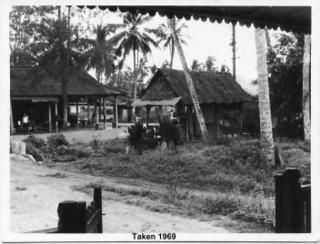 Chuck used to stay at a kampong in the Hillview-Bt Panjang area, where the present Bt Gombak complex stands. This doting dad actually spent 3 hours to rebuild his gun from memory for his 10-year old son Scott, and shared with the boy his childhood adventures in using the gun to shoot birds, lizards, dragon flies, cockroaches and all sorts of two-legged creatures. Not only that. He drove all the way from their home in Sengkang to Seletar Farmway, to harvest the 'bullets' from roadside plants which grew there(sorry still unable to identify the name of the plant). Later, when I had occasion to meet Scott, the kid was so proud in showing off his new toy to me; eagerly explaining to me how it worked and asking me to try it. At first, when I looked at it, I wasn’t terribly impressed. But when I tested it, I was really surprised at its effectiveness in terms of accuracy and range – you could easily fire it across the width of a basketball court and hit a human target. To my young friends out there. You must have heard your parents boast frequently about how creative they were in ‘inventing’ their own toys back in the old days. Well; you have just seen one example here. I will be sharing more examples with you in future articles under the series, Toys Were Us. The debate over the famous pianist rages on with several letters to the Straits Times forum page today. Frankly, I don’t see any need to get too upset over this. I am resigned to this fact of life: The talented and gifted will always get special treatment. Take the sportsmen for example. During my NS days (which was a very, very long time ago) the sportsmen always got excused from duty while the average Joes like me have to carry the extra load. I suspect it is no different today. I am reminded of my time as platoon commander in one of the combat engineer companies in 30 SCE back in the 70’s. Both my CSM and Coy 2IC were sportsmen. As such, we hardly ever saw them. (Although the CSM did occasionally appear out of nowhere and made his presence felt by screaming at the Coy HQ staff, and putting a couple of store men on charge and then disappearing unnoticed. Reminds me of this line from the famous poem, Sohrab and Rustum, “Like the lightning to this field I come, and like the wind I go away”) My OC was one of those, shall I put it delicately, ‘trusting type’ who left things pretty much to us. So the company was mostly run by the 3 platoon commanders, all NS 2LTs; which was a bit of a surprise to me – I thought the career soldiers should be much more ‘on’ than us NS boys. Things got so bad that one day, one of my men, who was on guard duty asked me; Sir, you kena take (extra duty) is it? No. I replied. Why do you say that? Oh; because I always see you on duty; if not DO then standby PC. Sigh. I know of someone who had a brilliant strategy to take advantage of the army’s high regard for sportsmen. Even though he was never much of a sportsman in school, once he got into army uniform, he became an outstanding sportsman overnight, specializing in one sport after another – depending on which sport was in season. As such, he spent a large chunk of his NS stint staying out of camp. Also, he was on good terms with some of the players in his team, who were themselves captains of other sports teams. Thus, he was able to become a reserve in sports that he knew nothing about; such as boxing. Every time there was a boxing match, he prayed harder than the officer-in-charge for the welfare of the regular boxers. Once his badminton team worn a championship and he went to his Bn CO and asked for 3 days off as a reward for his team members. “2 days. Take it or leave it”, countered the wise commander. He reluctantly took it ……. and then proceeded to see his Bn 2IC and got another day off. The same applied of course to the talented singers and dancers. I heard some of them never even got to put on an army uniform, let alone carry a rifle and charge up Pengkang Hill. I heard that one of them even became a famous director or something. 1. 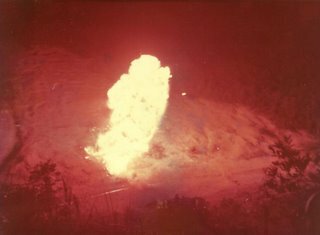 Blogging about the good old army daze. 2. Gazing at the beautiful lights of Jurong town in the still of the night from Tower 1 of Safti Magazine (the old Safti, now called Pasir Laba Camp – how I detest the government always changing the names of places and established institutions) and contemplating the meaning of life. 3. Gazing at the beautiful lights of Johor Bahru in the still of the night from Hill 180 in Marsiling (they didn’t change the name of that one; they simply bulldozed it away) and contemplating the meaning of life. 4. Watching beautiful tracers* skim the surface of Sarimbun Reservoir during night life firing, chased by their reflections in water below. 5. Trying to follow the path of the 155 artillery shell as it hurtles over a highway to the hill on the other side, in ROC (Taiwan). 6. Seeing many places that most Singaporeans never saw, nor will ever see; from the sand pits of Tampines, to the kampongs of Hong Kah, Bt Batok, Bt Panjang, Marsiling and Kranji. 7. Sleep-walking in a mine field (with dummy mines of course). 8. Sleeping in a flooded foxhole on a rainy night, after trying in vain to bale out the water with your helmet. At least nowadays, if I have difficulty sleeping at night, I can think of that foxhole - definitely beats counting sheep. 10. Last but not least, seeing Lee Hsien Loong clear rubbish in PT kit. * A tracer is a bullet that gives out light when it leaves the barrel. So you can actually see the path the bullet travels in the dark. 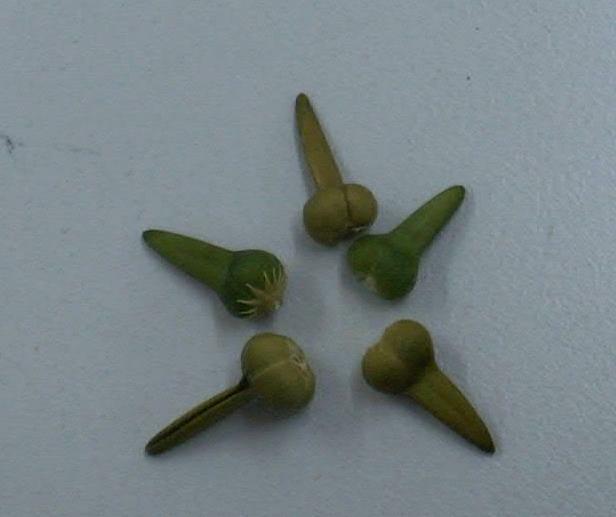 Can you tell me the name of these seeds and their uses? Hint: Long before some of you were born, we already had Counter Strike. Hi to all students who happen to read this blog. Since you guys are on holiday and quite free, maybe I do your parents a favour a give you an assignment. In my previous article I mentioned 2 things. How about you guys doing some research about these 2 items and educate the rest of us with your findings? Deadline is Friday - if no takers, then I remove this posting. Cuts, bruises, falls, bee stings and scalds were quite common place when we were kids. Today, I would like to share about some of the not so pleasant stuff that happened to us as kids - accidents. I want to issue a warning though. Many of the things that we did in the name of fun were downright stupid. To the kids out there: DON’T EVER TRY THIS; AT HOME OR ANYWHERE ELSE! The most common injuries were stepping on broken glass bottles. Apparently, there were quite a lot of broken bottles lying around. How they got there I have no idea. Kampong kids our time liked to run around bare-footed. So it was inevitable that we occasionally stepped on broken glass (as well as pig dung which was also in plentiful supply because we had a neighbour who reared pigs and let them roam around). When that happens, of course our mother would do the bandaging using gauze and iodine. Sometimes, she would grind a white tablet called ‘luk-kou-sum’ in Cantonese or 693, into a powder to apply to the wound together with yellow lotion. But I believe it was a kind of anti-bacterial medicine. Occasionally we also stepped on thumb tacks when we walked around the house barefooted. How on earth could thumb tacks be lying around so that kids can step on them, you may wonder. Truth is; I am not sure. What I am sure about is the pain that it caused. My own suspicion is that, it had to do with the rugs that we used to cover the wooden floors in the house, and these were held down by thumb tacks. We also had a couple of pretty serious accidents. Regrettably they all seemed to happen to my younger brother Chun Meng. There was this one occasion when my older brother Chun Seong and I were playing with an empty condensed milk can. I don’t know what got into our heads to play such a stupid game. We were tossing it back and forth when Meng happened to get into the line of fire. He suffered a nasty cut on head. The culprit who threw the can was not me. 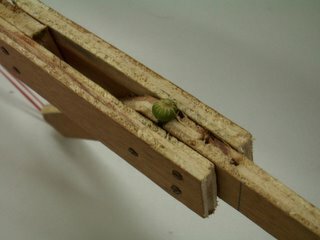 An even more serious accident happened to him when Seong and I played with spears which we made from the spine of attap leaves. We sharpened one end and hurled them at pile of freshly plucked coconuts. 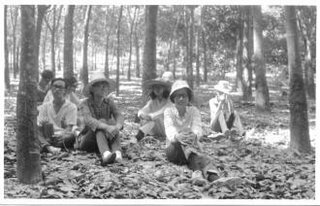 If you look at the photographs that I posted in the earlier article on Our Kampong, you would have seen that there were lots of coconut trees in our kampong. Many of them actually belonged to us. Once or twice a year, buyers will come around with sharp scythes tied to long bamboo poles to harvest the coconuts. It really was an amazing sight. We liked to watch if the coconuts would fall the workers’ heads. The plucked coconuts were then stacked into a tidy pile of maybe a couple of hundred to await other workers to come and de-husk them. This was another interesting process. It’s a bit hard to describe but I try. Basically, they embed a huge knife in the ground with the blade pointing upwards to about the groin height. 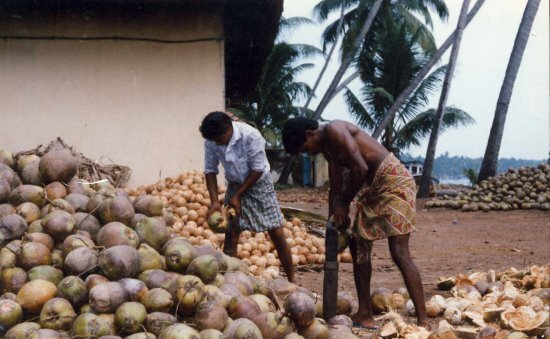 The workers, wearing leather aprons will then slam a coconut into the blade and push the coconut downward and forward with both hands to remove the husk in one swift motion. This they repeated swiftly and with great skill until all the husk is removed. Subsequently a lorry will arrive to load up the de-husked coconuts. One guy is stationed on top of the lorry while his partner will toss the coconuts 2 at a time up to him, which he caught with practised ease. We kaypoh kids would stand around to help in the counting to make sure that we did not get cheated. Then they would pay our parents and drive off. 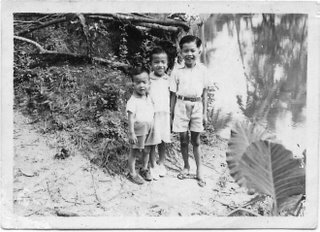 So there we were, Seong and I, throwing our sharp spears at the pile of freshly plucked coconuts, and our younger brother Meng was happily seated on top of the pile. Unfortunately, my elder brother’s aim was not so good (remember the tin can?) and his spear hit Meng on the left thigh. We will never forget the sight of the spear dangling from the poor kid’s thigh. Nowadays, we occasionally joke that if the spear had landed a couple of inches higher, today we would have 1 niece and 1 nephew less. Another accident that took place at our house happened to our cousin Chee Keong. The guy was climbing up our guava tree to pluck guavas. Lost his footing and had a nasty fall. We learned a couple of lessons from his misfortune. One, we learned the meaning of the ‘chim’ word “dislocation” because he suffered a dislocated shoulder (or was it elbow?). We also learned what a cast looked like when he returned from hospital. Anyway, that accident did not prevent him from getting an econs degree and subsequently rising to become a top dog at PSA. Finally let me tell you about the time my brother Chun Seong stepped on a rusty nail. One night, we decided to sneak out of the house, he and I, to follow some of the other kampong boys to catch crickets at a deserted house nearby. It was very dark, and we had to use torch lights to hunt for the insects. Suddenly he gave a yell, and on examination, we found that he had stepped on a rusty nail which penetrated right through his rubber slippers. We were in a dilemma because we did not dare to tell my mother for fear of getting a thrashing. Fortunately, there was a budding doctor in our midst. He told us to use the slippers to slap the sole of the foot to dissipate the ‘poison’; and then to bandage the wound with ‘ti tan heok’ or iron-nail leaves in Hokkien. 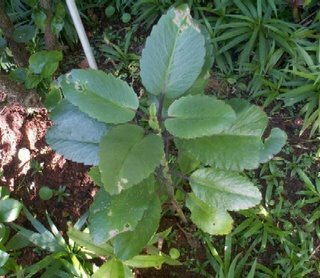 I believe the correct name for the plant is (落地生根), you know the type where, if you toss a leaf to the ground, days later, many small plants will grow from the edge of the leaf. I don’t know which hospital the kid is now practicing in, but his treatment apparently worked, and today, my brother Chun Seong is happily enjoying his retirement in that beautiful country down under. There were many other accidents here and there and most of us have the scars to prove it; but I have only selected a few of the most dramatic ones for mention here. Maybe my brothers, on reading this blog may be able to add some more details. My brother Seong, who can’t aim straight trying to light a fire-cracker. Behind him is our durian tree. I think I need to explain a bit about the photos you see in this blog. You will notice that many of the old black and white photos had people posing (cham - my daughter is going to call me a ‘poser’). Please don’t think that people of our generation are so vain. It’s just that camera films those days were quite expensive; and thus it would be considered a waste if we took pictures only of scenery or buildings. It was thus customary to pose with the scenery as background. Let me tell you a bit about the cameras we used those days. 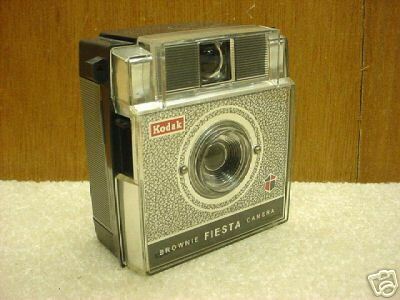 The earlier pictures were taken with our first camera - a Kodak Brownie. It was an ‘auto-focus’ camera, meaning you don’t need to focus - because there was no ‘focus’ function! It had small circular window behind for you to read the number of the photo you are taking. After taking 1 picture, you have to wind the film slowly till the next number appears in the window. Now if you forgot to do this, then the next picture you take will go on top of the previous one, and you have wasted 1 valuable photo plus whatever you took earlier is lost. 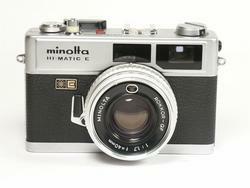 Our second camera was a Minolta Hi-matic. We bought it around 1969 (not 1967 as I said earlier). It of course had more features like focus, aperture etc. This time, to advance the film, you need to push a lever. But if you forgot to do it, there is an ‘idiot-proof’ mechanism that prevents you from taking the next picture. Interesting eh? The photo below is my first colour photo. It was taken around end-1970 just after my HSC (A-levels) exams. 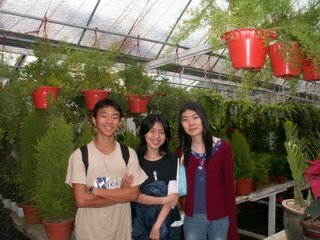 I went on a tour to Malaysia with my parents and my elder sister. We brought along 1 roll of colour film. 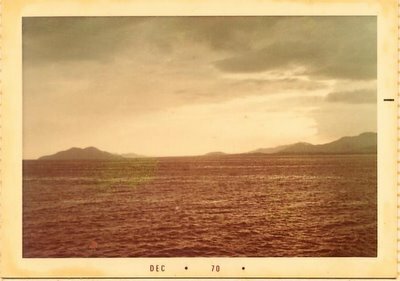 During the ferry ride across to Penang, we came across this beautiful scene of the setting sun and we decided that it was time to use our precious roll of colour film. An interesting thing happened in Penang. At the hotel we stayed in, there was a stir in the evening around dinner time. It turned out that an up-and-coming teenage a-go-go star was also staying (or performing) at the hotel. Some of the girls in our tour group got very excited and wanted her autograph. Can you guess the name of the singer? Answer - Nancy Seet. Today we are in the digital age. I am proud to say that this ‘uncle’ is quite familiar with digital photography. I was probably one of the earliest 'ah laus' to invest in a digital camera. My first digital camera was an Epson which cost about $700+. It didn’t come with an LCD screen, so I paid extra for an attachment; which was a mistake because I never got to use it. The reason was, the 4 pieces of AA batteries get used up so quickly, it was not practical to use the LCD screen; plus it was a bit clumsy to have a separate attachment. I have also learnt how to take and edit my own digital videos. I did all these not because I am a camera buff, but because my job as a consultant and trainer requires it. Actually I quite enjoy learning all these cool gadgets – only problem is people our age learn such things very slowly. Hey! How come nobody could identify the singer of this song? Anyway, the singer was 尤雅. I believe she was popular in the early seventies. 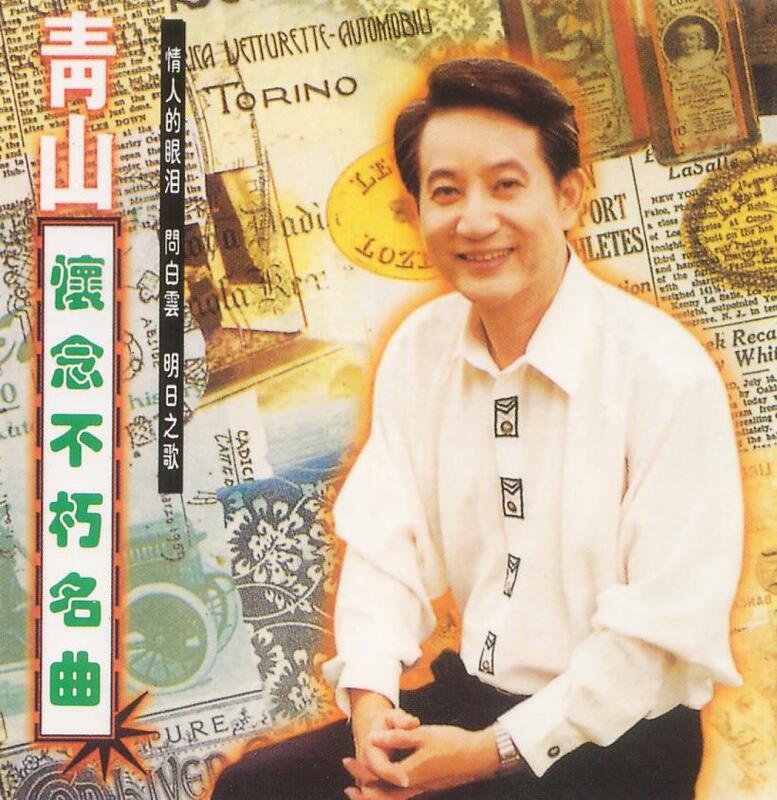 My favorite Chinese singers from that era were 青山and 姚蘇蓉. My favorite 青山song was 唯一爱的人. At one time, we had an EP (45 rpm record) with this song on 1 side. Not long ago, I came across a CD with this song in Rochore Centre. Cost only a few bucks. My favorite姚蘇蓉song was 不得了. 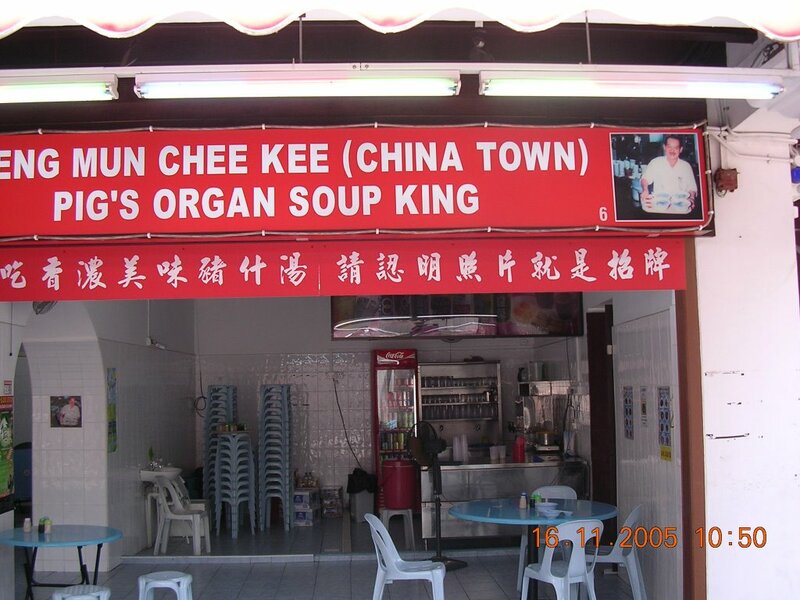 I once heard it being performed live by the famous ‘Laurel and Hardy of Singapore’, Wang Sa and Yeh Fong at a theatre located at the present Mustaffa Centre. I think it was called President Theatre. It was so hilarious we (as they say in Hokkien) ‘laughed until stomachache’. At that show, a famous Taiwanese singer by the name of Chang Ti also performed. This guy could improvise the lyrics of any song given to him. Actually, now that the brains start racking, there is another 姚蘇蓉 song that I liked very much. It's called 秋水伊人.The lyrics are very touching. So all you young people out there. I presume you have not heard this song before. I give you the opening lines and you try to guess what this song is all about. This lane which links Smith street to Sago Street, holds many, many memories; and is witness to numerous incidents and events. My friend Chun Sing's description of life in Sago Street and Sago Lane is so interesting, I could not resist going down there this afternoon to take a look. Good thing I am self-employed and so no worry of being scolded for taking a 2-hour lunch break. Besides taking some pictures of the area, I also helped myself to a nice bowl of beef noodle from the Chinatown hawker centre. Can you spot Sago Lane? Looks like the Street of the Dead has become a dead street. But it also appears that the govt is trying to resurrect it. Victor commented that Part 1 was an anti-climax. I did promise that I would share later why I was morbid of the Sago Lane (沙莪巷 ). Indeed as the colloquial name spelled, Street of the Dead [死人街] where funeral parlours (Cantonese clan) were housed speaks much for itself. Incidentally did you know that the colloquial name for Sago Street where I lived is also known as ‘ 庙仔街’ ? Sorry, not to digress your thoughts. There was one incident I recall happened when I was on my way home (I was 7 or 8 then). I took the challenge to myself of walking past Sago Lane one evening. Funeral parlours were located on the ground floor of this colonial 2-storey terrace blocks along that street. The upstairs were converted as hospice where the dying was housed till they depart. Immediately the corpse would be removed to the floor below and the necessary procedure to be addressed by the undertaker. The old Singapore under the British colonial rule then, offered no proper hospice-type of premises for the dying, and Chinese migrants were not favoured to die in their homes. Hospital treatment was not popular among the traditional Chinese migrants in those days so the only place they could utilise was the upstairs of these funeral parlours. If these people could afford they would prefer to return to China (where their home land was) to retire. But after the communist regime had taken control of the whole of China after the 1948, the Chinese in Singapore had no way but to stay behind instead of returning to their home land. This also explains why the Chinese cemeteries were left empty all those years till the 50s came along. This was observed by my late father. I remember him telling me that the Pik San Teng [ 碧山亭坟场] cemetery ( located off Thomson Road and Braddell Road) was generally scarce and scanty with graves but beginning from the early 50s it began to get crowded. That Pik San Teng had now become the land for the living…the Bishan housing estate, and the mass rapid transit (underground subway) runs through it, geographically dissecting through the whole area. Ironically enough, the ex-occupants of this area were underground. Now the MRT runs through it above ground, in fact, this is the first train station where it begins to surface above ground after all the city stations that are underground. This route winds its way round the north and western part of the island of Singapore (all above ground) till it returns to the city area in an almost anti-clockwise format. Again this is just an observation. Looking at the upstairs of one of the parlours that evening I saw this old woman with her frail sickish looking face starring at the people on the street and probably so, looking at me. I was not the only soul on the street, of course, but probably the only person who took attention at her dying state. 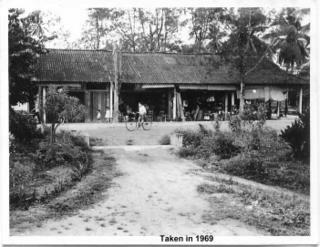 One side of the street was arrayed with hawker stalls while the other side was lined with these parlours including a coffin sellers. In fact it was a busy evening as usual while the hawkers were busy setting up their stalls on one side while the other side (the parlours) was busy at their activities. In my recollection there were at least 2 coffin shops. Some of you who may not have seen what a Chinese coffin would look like. Tell you, it is not the best looking sight of all. I dared not take the second look after that…but walked hurriedly straight on for home, which was just the next street anyway. But that sight till today I have not forgotten one least bit. It was a morbid thought that this woman was passing away. I did not want this woman to leave this world because I was not sure where she would go and neither did I know any one would go then. That woman seemed to be telling me to treasure this life because her life was ending and she would not know where she was going too. She may have thought to herself how wonderful it would be if she could rewind the clock to go back to the age where I was then, a child of 8 years old so that she could start life all over again. I promised myself not to ever walk that street again…but I did in fact in my later life to attend my aunt’s funeral wake in 1979 and in between I missed several of my relatives’ funerals for that reason! I was grown up then…so that was all right. This is a photo of Sago Lane in the 60's. On one side, you will see the parlour which they have a nick name .... “convalescence centre”. On the other side are hawker stalls. I will narrate an experience with one of the stalls in next episode. She said of morbid experiences of ‘sighting’ spooky figure hanging about in the toilet located at the back of the parlour and to get to answer your nature’s call one had to walk past the bodies some were not even placed inside the coffin. Accordingly there were usually more than one funeral wakes all held in the same parlour in order that the owner could make a few dollars. 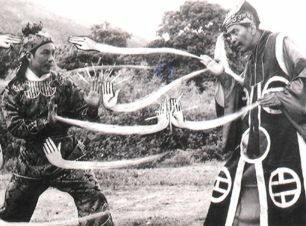 In funeral wake of the Cantonese tradition, Taoist monks who were generally odd-jobbers during the day would gown themselves with the deep yellowish Taoist attire and chanted their due for a couple of hours accompanied with drum and cymbal and even Chinese flute with their usually litany and who knows what they were chanting. For all we know, they may not even understand what they were chanting about. I had once witnessed a ritual procession in the middle of Sago Street which accordingly the Taoist monks (about 5 or 6 of them in all ) were ‘enjoying’ themselves in this so-called sacred act of ‘por-de-yu’ (break through the nether world to rescue the dead) [破地狱]。 There were lines of little oil lamps lid up with a tiny flame on the floor each lamp was aligned with some ceramic-like roof tiles which we were supposed to take it as ‘gates of the nether world’ [ 鬼门关 ] My contemporary, Ah Fei [ 阿辉] (who was of the same age hence my regular playmate at that tender age told me that if I wanted to see the dead coming to life, all I needed to do was to get near to these make-shift monks and wipe my eyes with their gowns. To be honest I was very much tempted to do that but guessed that I did not have sufficient guts to do that then. But what really caught my eyes was one of the ‘dancers’ (monks) was giggling embarrassingly. So were they serious or having fun instead? Mind you they would walk away with a hefty sum that evening, paid by the family of the dead whom they were supposedly to be chanting the know-not-what litany. I heard from older folks that according to the traditional Chinese folklore, there are 18 levels of punishment in the nether world and each level is facilitated with its respective gadget of punishment to the dead who did unjust things while they were alive. These monks were supposed to rescue that dead from the darkest level of hades in order to reduce the amount of suffering. No one wants to die or perish eternally yet we all have to die one day. That thought used to frighten me … just as the Bible says..’ as it is appointed for men to die once, but after this the judgement’. I can honestly say that I have found the answer to this life-long question of life after death….. I studied in Braddell Rise School (BRS) from Primary 2 to Primary 5 from 1960 to 1963. So did my siblings and my cousins (the Ng family). I don’t think any of you reading this blog have even heard of BRS. 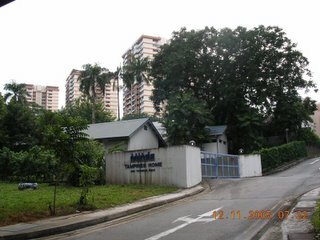 It was situated next to Mt Alvernia Hospital at the junction of Thomson Road and Braddell Road. It was a small coed, primary school. It was closed down a number of years ago. 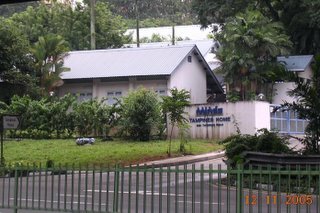 Today its premises are occupied by the Tampines Home (MINDS). It’s quite inconspicuous. If you passed the area, you might not even notice it. Even this appears to be a temporary arrangement. A great deal of construction is going on around the area. I believe they are constructing a viaduct to join Braddell Road to the Lornie Viaduct; and hence I really do not expect this landmark to be around for long. So I went down recently and took a couple of pictures. How come Pr 2 to Pr 5 so odd? Actually I was admitted to Anglo-Chinese Junior in Barker Road in 1959. But after 1 year, my parents transferred me to BRS because ACS was too far from our home in Lorong Chuan, and my elder brother David was in BRS and could look after me. In 1964, my brother was admitted to ACS Secondary in Barker Road and so my parents tried to transfer me back to ACS Junior. However, there were no more places and so I went to ACS Primary in Coleman Street instead. It was a scary experience for a kampong kid to take a long bus ride from Lorong Chuan to North Bridge Road, alighting opposite Capitol Theatre, cross several streets to get to school. My father brought me to school on Day 1 and after that I was on my own. 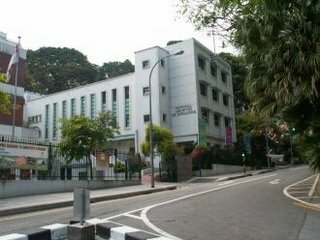 Fortunately, I only had to spend 1 week there because an opening came up in ACS Junior and so back I went to Barker Road. During the 1 week in Coleman Street, I got to know a round-headed kid by the name of Simon Chu Chun Sing. One year later, we were reunited when both of us got admitted to ACS Secondary. To this day, we remain good friends, although separated by several thousand kilometers; he in windy Scotland and I in sunny Singapore. Besides the round-headed kid, I also got to know a long word, ‘courtesy’. I remember this banner with the words, “Courtesy begets courtesy” prominently displayed in the school. Everytime I drive past this building I think of these words. 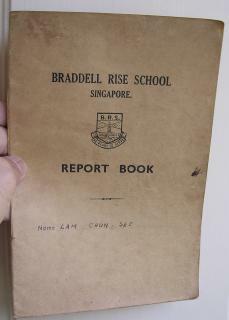 Coming back to Braddell Rise School - what can one recall about school more than 40 years ago? Apparently quite a bit to my pleasant surprise. Our principal was a Mr Marriappan. In Primary 3 our teacher was a Mr Tan – he turned out to be a brother of my 11th Aunt. He was quite bald; which was uncommon those days. He told us, he came from a poor family and couldn’t afford shampoo and used to wash his hair with laundry soap or sabun. (I suspect his theory is not correct. Nowadays everyone can afford shampoo, and how come so many baldies?). In Pr 4, we had a Mr Chew. We liked him. He used to bring us, a few of his favorite pupils, for ‘excursions’ to places like Botanical Gardens in his Ford Prefect. He also taught us how to sing Yellow Bird. He once told us a story of Dracula – the girls were so scared, they huddled together, 2 to a chair. Wait a minute – was that Mr Tan??? But Mr Chew was also quite fierce. Many of the boys got slapped. I got slapped once; not on the face though, but the back of the head. My protective brother David witnessed it and it seemed to hurt him more than it did me. Most were kampong kids from the neighbouring areas like Kampong San Teng (Bishan), Thomson Road and Potong Pasir. Unfortunately, I can’t remember any of my friends from that era except 3 kids with Christian names. Those days, it was rare for people to have Christian names. One was my good friend Daniel who lived at Bartley Road. The other 2 were girls by the names of Freda Neo and Catherine Yap. Hope they are reading this blog. Then of course there is sports and games. 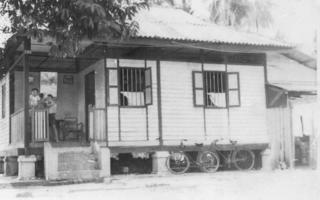 We had 4 ‘houses’ named after the roads around us – Braddell, Lornie, Thomson and Caldecott. The sports field was located behind the school at the top of the hill where the present Assisi Home and Hospice stands. Sports Day was quite memorable. We had sack race and ‘fishing ping-pong’. The sports field was also where the boys played our favorite ‘bola hantam’ where we try to hurl the ball at our opponents – certainly not a game for the faint-hearted. I remember there was this left-handed chap from Potong Pasir, His throw was really powerful, and left an ugly red mark on our backs. Sometimes, the ball would land in the neighbours’ bungalow compounds, and some brave soul would have to scale the fence to retrieve it. The bungalows usually belonged to Caucasian expatriates and were located where the present Mary Mount Road is. Towards the end of my stay in BRS, which was around 1964, I once peered over the fence of our sports field and saw, in the distance, a huge piece of land being cleared by bulldozers for as far as the eye could see. 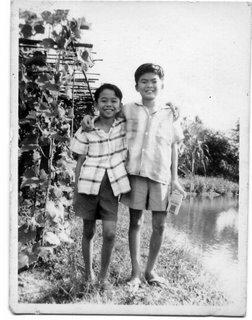 Bear in mind that this was 1964, and it was indeed a rare sight for this kampong boy. I didn't realize it then. I was witnessing history being made. They were building one of Singapore’s earliest HDB estates – Toa Payoh. Another game we loved to play was kuti-kuti. These were tiny plastic animals which we used to fight each other. Basically you take turns to try to flick your animal on top of your opponent’s. The winner of course gets to keep the opponent’s animal. I am afraid it’s a bit difficult to explain, but if you were from my generation, you know what I am talking about. What trip down memory lane is complete without describing the food. 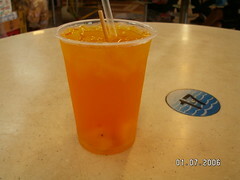 One person at BRS we all loved was the friendly drinks vendor called Fong Jie. She was often dressed in white. She allowed us to mix our drinks of different colours; e.g. cherry, orange, sarsi or ice-cream soda and so on to form 1 full glass. The other person we loved was the pineapple drinks man who operated his stall outside our school gate. One glass of pineapple drink cost 5 cents. On days when we were broke, he gave us free drinks: minus the pineapple cubes of course. There was also an Indian sarabak stall outside our school. We like to watch the cook prepare the pratas and toseis. What amazed me was the water. The Indian workers who ate here simply scooped the water from a big rusty 55-gallon oil drum. Amazing isn’t it. Talking of tuck shop food, ACS takes the cake. There were 3 stalls that we loved; the macaroni, beef noodle and curry rice stalls. The curry rice was a bit too expensive for me, so I can only recall the smell. As for the macaroni, it is served with minced pork – simply the best. To this day I seldom take macaroni. Why? Because I just can’t find anything close to the one at ACS. The beef noodle came at 2 prices; 20 cents and 30 cents per bowl. For 20 cents you get 3 thin slices of beef, whilst for 30 cents you get more of course. However, even at 20 cents, we were allowed 1 additional helping of the delicious soup. But my friend Chun Sing was quite brave; he went for repeated helpings. In 1969 I went to National Junior College. We were the pioneering batch. Well, the food there wasn’t exactly memorable (or maybe there were distractions? I don’t know.) Anyway, I only remember the long walks across the football field, up a steep slope to reach the canteen in Dunearn Technical School during the first few months when our own canteen was not ready. I often lunched with my good friend Leong Soon Wah. He often teased me for my love of pineapples. Unfortunately, we never kept in touch after JC. Must try to track him down one of these days. So there you have it. My memories of the little known Braddell Rise School. Our school’s motto was: BE READY TO SERVE. Now I have a confession. How do you think I am able to recall details like this from more than 40 years ago? I still have my report book! Once in a while, we read of cases of nasty accidents in the SAF, or of young NSmen dying of heart failure during training. Although this is extremely rare, nevertheless we parents still worry like crazy when we send our children to NS. Those of us who are religious pray for their safety from such accidents. While such cases tend to be dramatic and attract lots of media attention, I feel that the danger from picking up harmful habits is much greater. Today, there was a front page report in the papers about 2 young men who were infected with the deadly HIV when they were doing NS. This reminds me of a case I encountered back in the 1970’s when I was a platoon commander in 30SCE in Mandai. One day, one of my men came to me for permission to go to Middle Road Hospital for treatment, twice a week (or something like that). At that time, Middle Road Hospital (hope I got the name correct) specialized in sexually transmitted diseases. “You have VD is it?” I asked. “Yes”, he replied somewhat shyly. But to my horror, I detected a hint of pride in his voice. Apparently, my men have been organising tours to Hatyai for their R&R after they completed their BMT. Some of these young, immature kids were proud that they finally achieved manhood, and even have the evidence to prove it. Another sad statistic to share with my readers. At the beginning of their 6-month course under me, there were only 2 smokers in the whole platoon of nearly 30 men. By the end of the course, there were only 2 non-smokers left, myself being one of them. We know that the SAF is well-aware of this problem and is taking proactive measures to address it. I hope they succeed. But for today’s NSmen, I believe, the dangers may have increased considerably since my time. My pal, Chun See asked me to an contribute articles of my childhood days in the Chinatown of Singapore (牛车水). I have actually compiled a series of episodes from recollection of my early formative days as a child in the Chinatown, which many called it - ‘a land where snakes and dragons mixed’ (龙蛇混杂之地). Sadly I had accidentally deleted all these articles in my pc system…really heart-breaking!!! Yes, I grew up in that sort of place where many exciting yet undesirable habits and incidents came my way and had to this day set my personality and more so caused me to see what’s beyond what this life could bring. I stayed at No. 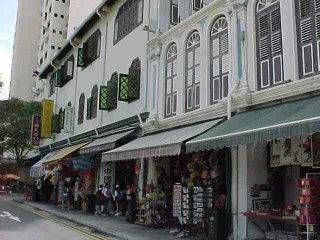 6 Sago Street, right next to the famous Sago Lane (沙莪巷 ) where the funeral parlours were housed (also known colloquially as Say Yan Gai [死人街] or ‘Street of the Dead’). That street has always been a taboo to me….never dared to tread in the night not even during the day. Tell you why later….. However when people asked you in those days where you lived I was taught to say, ‘The floor above Zhou Hoong’(周鸿), and not No.6 Sago Street as one would normally do. Zhou Hoong (周鸿) was a Chinese chiropractor (跌打医师) who owned the shop below my place, and supposedly everybody would know him because of his practice in the chiropractic. I used to loiter around his shop and of course nobody took attention of my presence then. I was small-built but with big eyes and you know what? I had double eye-lids. No a bad looking kid but even so…..
Zhou Hoong had a vehicle, a dark green one I remember. He had to wind the torque at the front to start up the car engine every evening when he had to display his mobile store all over the Chinatown or other parts of Singapore then. He had his son to help him; a polio-infected lad walking about with steel structure on one of his legs. We are talking of the 2nd half of the 1950s. 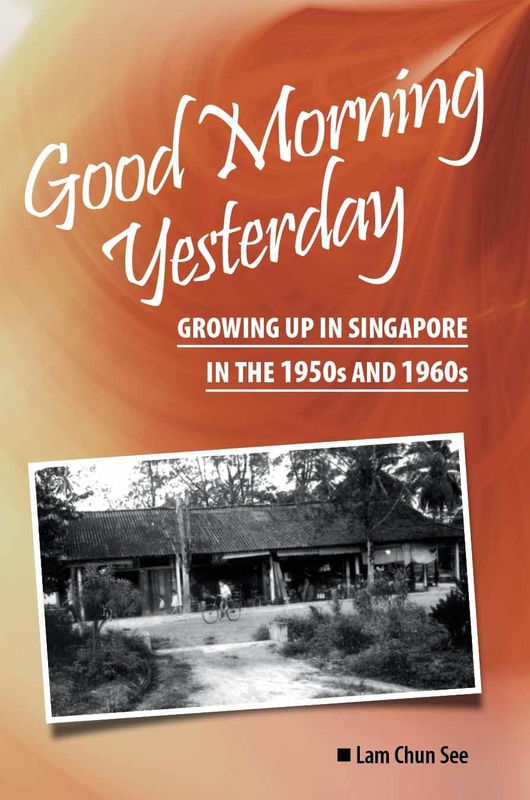 The place where I was brought up was not as exciting as many of the present generation would imagine…where the average-income family would put up in a HDB built apartment of 3-4 rooms with ensuite bathroom and a common bathroom. I think, in today’s terms, it can be regarded as ‘ghetto’? It was just a single room where I had to share with my parents and my 2 younger sisters, and later my 2 brothers came along. There were 10 rooms on that wooden floor, and that meant 10 families all shared the same toilet facilities infested with cockroaches and centipedes. The kitchen was filled with charcoal-burning stoves and some used the kerosene fuel stoves. Hence, every evening during meal time, smoke and soot would fill the air. If during the rainy season (monsoon), tough! Black soot would drop onto your food, condensed from the black ceiling, falling like stalagmites. It was then that my father decided it was time to move out of Chinatown. The other reason was that he did not want me to engage with the bad influence where the triads and gangsters roamed the streets, either asking for protection money or other devices. We had no fan in the room and one day my father bought his first electric fan home and got my next room neighbour Ah Kuan (阿坤) to install it. I experienced what it was like to feel hot! Just as the saying goes, ‘When you do not have it, you don’t miss it’. The brand I still remember was KDK, a Japanese make. Come to think of it, my father who later in life explained to us the reason he had to fetch us (me and 2 sisters) to the Clifford Pier and the Esplanade on some evenings was to get cooled…i.e. chill out! That had always been my highlight because I liked being out to watch the harbour front and the night sky. And when walking past the Fullerton Building it was always filled with twittering sound of sparrows or swallows nesting at the roof crevices. This sound still rings clear in my memory till this day. That area was not as glamorous as we see of it today. It was dimly lit with fluorescent and sodium street lights….Still it was my highlight of the week when being taken out for a walk to the harbour front. I would always pester my father to get us to the kachang puteh man (Indian origin with a tray of assorted nuts above his head). We would pick our choice served in a rolled up conical used paper pack at a cost of just 5 cents and if you wanted cashew nuts that would cost….probably 10 cents, I guess. Not sure because we hardly bought that. May be that is the reason why I like cashew nuts because I missed it as a child. I had always wondered since I was about 5 -7, where old people came from when I loitered along the side lane below the window of my room. I asked where would these people go to one day ? In my recollection these people never spoke the Cantonese that I knew… they spoke a foreign dialect and they were dressed in black traditional Chinese attire. Looking back they must have spoken their country side dialect known ‘Say Yup Hua’ (四邑话) which is part of the Cantonese county in GuangDong (广东省) province of southern China. My father could understand them because he spoke to his parents in that dialect while in China. I have never met my grand parents as they passed away while in China when my father had to return to Singapore at his late teens just before the war! Today my father has moved on in life too and joined those forgotten ones down the memory lane. So what is life I used to ask myself! I remember asking my father that question while he and I were both waiting at the Tan Tock Seng hospital 4 years ago just before he passed away suddenly. I shall like to continue in the next episode if Chun See would allow me on his blog. Blogging Is For Kids Only? Recently, I attended a training workshop on e-Commerce. During the break, I took the opportunity to ask the trainer to teach me how to insert a counter to my weblog. Yes, I know it's child's play for the youngsters, but for a 53-year old newbie to blogging, it is quite a challenge. Anyway, one of my fellow course participants, a 30-something looking lady, overheard us and remarked, "Hey, I thought blogging is for kids only?" "I don't think so." I replied; "Anyway, I enjoy it". Actually, as I far as I know, very few Singaporeans of my age blog. I came a across only a handful, including Frannxis, Victor Koo and Mr Tan Kin Lian of NTUC Income (please see links on right side of this page ). I think more older Singaporeans should blog. Firstly it is good for our aging brains. Putting your thoughts into words is great exercise for our brains. You also get to learn new things - like how to create a blog, how to insert pictures and links etc. Last year I attended a seminar by Tony Bunzan - he recommended continuous learning and lots of exercise for the brain as an effective way to keep away dementia. Secondly, you get to meet people with similar interests. I have found a few new friends like Frannxis, Victor and Chris - By the way, thank you Victor for teaching me how to insert link. Lastly, people like me like to write; plus digging up those old memories is great fun. PS - I like that snippet they play on the radio which ends with the line, "See - you do learn something new everyday". The other day I learnt the meaning of LOL. I often see it in other people's blogs. I always thought it meant Lots of Love. 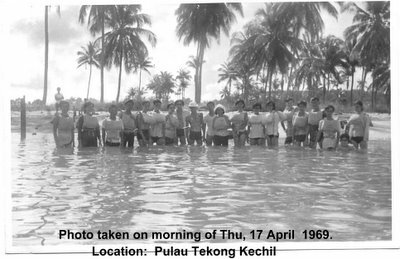 After reading my earlier post on our kampong , a fellow blogger, Ms Ikan Bilis said she missed her kampong days in Pulau Tekong. I too have some fond memories of P. Tekong. Actually, I only have 2 sets of encounters with this little island. The first was from attending a 1-week camp organized by the National Junior College Outdoor Activities Club in April 1969. The second was from a couple of in-camp training sessions in the eighties. Surprisingly, I have more memories from the first encounter. 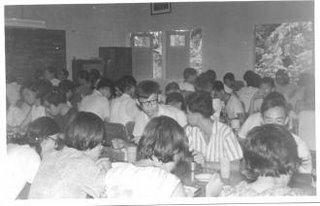 The 1-week camp in 1969 was very enjoyable and memorable. We did a lot of trekking and I remember seeing many rubber plantations and small Chinese temples. We also heard stories of people being bitten by hornets. One of the most interesting sights was that of a hill full of tobacco plants. 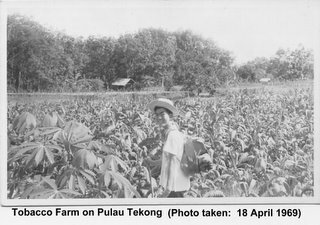 You must be surprised to know that tobacco was actually cultivated right here in Singapore. Fortunately, I still have a photo of this place. The other thing I remember was the canoeing. We were assigned in pairs, 1 boy and 1 girl to a wooden boat, (unlike the modern fibre-glass kayaks that our kids enjoy today) and we had to row round the island. At one point I was so exhausted that I just had to stop. Just at that moment, one of the instructors came along and scolded me; “Do you want the lady to row for you?” And boy, did that bruise my ego? 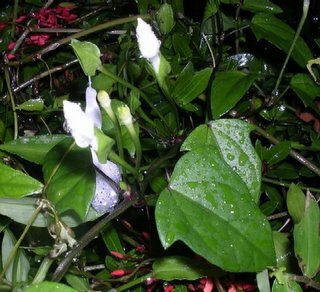 Anyway, to continue with the story, that night we camped near a Malay kampong. The kampong folks were kind enough to let us use their well for our baths. Next morning, when I woke up, every muscle in my body ached. Our base camp was at one of the schools. When we were not out on expeditions - they called them land, canoeing expeditions and so on - we had our meals there. On the last night, we had a big camp fire. We were grouped into teams that had names like Andies, Rockies and Pyrenees. My team was called Rockies. Below are some members of my team. As for the few in-camp training sessions in the 1980’s, I don’t have much recollections. The one thing that sticks to my mind was the incessant howling of dogs at night. Strange thing is that, the next morning, we couldn’t find any dogs around. According to the soldiers, the island was haunted; but then you know soldiers lah - they like to say things like that. In fact, I have more memories of the trip to and from the island than the actual training in Tekong. For example, I remember returning to camp one Sunday night. We had to take the bumboat back from Changi Point. They were playing a song by Teresa Teng (你怎么说) on the bumboat. It’s very strange. Somehow, when I was on the way back to camp on Sunday nights, the brain seemed to be especially receptive to surrounding stimuli. I remember another occasion, when I took a pirate taxi from Bt Timah, 7th Mile (the old Beauty World) to camp in SAFTI. That was in 1971 during my recruit or section leaders training days. We didn’t have much choice actually – so many soldiers going back to camp (Safti and 6th SIR in Tuas) and so few bus service 175’s. The pirates did our nation a valuable service if you ask me. I remember the song being played in the taxi was 心上人 by a local singer ( 张 小 英). There were several other occasions, in other camps; somehow the memory is very clear. But nothing really beats the feeling of seeing the lights of SAFTI appear as our bus rounds the bend on old Jurong Road. Your heart simply sinks to the floor of Green Bus number 175. My brother David, writing all the way from Perth, recalls how he used to catch eels during our kampong days. We will first catch the ordinary garden worms, hook one on a small hook tied to a short nylon line trace of about 12-18 inches long. This trace in turn is tied to a short thin bamboo stick. We will then wade along that famous river and look for the "homes" of these yellow eels. Usually, when we see a hole at the banks of the river, and such holes are at about water level. We will then use another bamboo stick to push the hook (with the worms on) into the hole. Since we do not know how deep the eel is hiding in the hole, we will make "muck, muck " sounds with our pursed lips to attract them out. Its quite effective. The second method is easier but usually end up with smaller eels. We will look for small rocks lying in the shallows of the ponds on our land (2 of them ) or the 2 adjacent to ours belonging to our neighbour. Usually, we can find eels hiding beneath such rocks. However, they tend to be "baby" size. 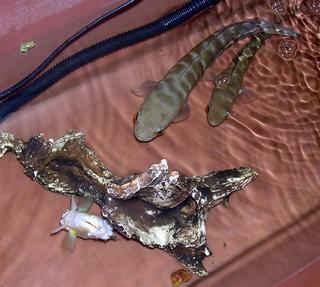 All eels caught based on above 2 methods were always sold to a traveling "fisherman". He comes along in his 3-wheel motor bike. The eels are sold based on weight, but I cannot remember how much we could fetch. Rather, what I could remember is one type of cooked fish that he sells: a sort of steamed cooked fish, very salty, and ready to eat ..... probably some kind of Teochew style of cooking. guppies) , end of the year catching catfish and Aruanas on dried ponds were definitely more interesting. Also the way we catch our "Luai " (aruana) fish from the neighbour's ponds were pretty interesting. Unfortunately, you and Meng were too young then. I am not sure who were with me doing those stuff except No 7 auntie's son (Ah Tee) who was quite into spiders. 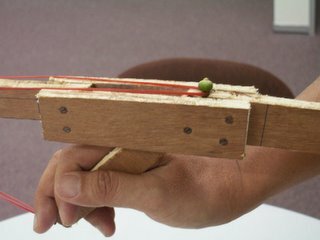 I will include cuckoo catching and the home made catapults (and shooting of birds) in the next e-mail. But both these activities are very cruel ways and I would rather forget such episodes. " Yes, catching fish and other animals was indeed one of our favourite past times those days. Talking about catfish, I remember how we caught them at this small pond with lots of water hyacinth. (Hyacinth is harvested to form part of the feed for pigs). It was very different from the usual method of holding the rod and waiting for the fish to bite. We would usually use a short bamboo rod and short fishing line, and coil the line around the water hyacinth and then go away. When we come back after a couple of hours, we can see the catfish hooked to the line. We had to be very careful in unhooking the catfish because its sharp pectoral fins (I think that’s what they are called) were reputed to give a painful prick. The catfish also tended to bleed a lot. Earlier this year, during the Chinese New Year gathering at our cousin Chee Keong’s house, we were reminiscing about the kampong days, Our cousin Chee Kean recalled one interesting fishing episode. Usually, our neighbour who owned the pond, would allow us kids to fish anywhere in the pond except for a certain fenced off section where he bred red tilapias for sale. However, he and David apparently decided to venture into the forbidden territory and managed to catch a big red tilapia. When our neighbour spotted them, he gave chase all the way until my uncle’s house. I cannot recall what punishment, if any that the kids suffered as a result of this daring raid. The ‘luai’ fish that David referred to above, I believe were tomans or snake heads (san yu in Cantonese). The Americans call it the ‘franken-fish’ because it is carnivorous and have a ferocious appetite. We saw some of the older kampong boys use frogs as bait to fish for it. But for us younger kids, we would catch the babies from the shallow edge of the pond. How? – by clasping our hands to form a semi-circle to encircle the fish; then slowing moving backwards before sweeping them to the shore in one quick movement. I often tell my kids about how we caught the baby tomans in this way as well as fighting fish using the ‘punki’ or rattan basket. Maybe that explains why my teenage son has fallen in love with fighting fish and tomans. Our house is now filled with jars of fighting fish which he breeds; although he wouldn’t dream of letting them fight. We even have a toman which he bred from a baby. He bought it from the aquarium which sells them as feeders for arowanas at $2 per packet. Before Lorong Chuan was constructed, it was a mud track that joined directly to Braddell Road. At that time our address was 288 Ang Moh Kio. In order to get to our school, Braddell Rise Primary which was located next to Mt Alvernia Hospital, we had to cycle from our house out to Braddell Road, chain it to a lamp post or roadside railing, and take a bus to school. Usually, my elder brother, David would do the cycling and I would ride on the back seat. I remember one very yucksy incident that happened one morning. As we overtook a bike in front of us, the chap decided to turn aside and spit. Guess where the projectile landed – yes right on me; exactly which part of the anatomy, I cannot recall. But you can understand why it was an unforgettable experience. I cannot recall which year Lorong Chuan was built. It joined Braddell Road to Ang Sar Lee. I think most adult Singaporeans know that’s the Hokkien name for Seranggoon Gardens. At the time when construction was nearing completion, many Ang Mors liked to use it for go-kart practice. That was quite an eye-opener for us kampong kids. With the completion of Lorong Chuan, we did not have to go to the market at Lim Tua Tow Road at Gor Ko Chio (5th Mile, Upper Seranggoon) to do our marketing. Instead, we did our marketing at the Seranggoon Gardens Way Market , located opposite the post office. Sometimes I was tasked to do the marketing alone; which meant I had to cycle to SG and back. I picked up some skills in selecting pork and vegetables then. 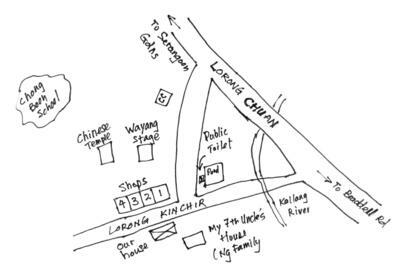 After Lorong Chuan was completed, our village was renamed Lorong Kinchir, and our house address was also changed to 21-A Lorong Kinchir. Below is a sketch of our neighbourhood. After some consultation with my eldest brother, Chun Chew who has an uncanny ability to remember all sorts of details about our childhood days, I believe the diagram below is more than 80% accurate. Now, can anyone guess what is that? It is the Cantonese name we gave to the Kallang River. Literally, it means Dead Chicken River – no prize for guessing how it earned such a colourful name. Every time we crossed the bridge, we had to hold our breath because, not only chickens, but dogs and pigs were discarded into the river. Better not go into any more details. Would you believe that we have actually seen kids frolicking in the waters of the Sai Kay Hor. 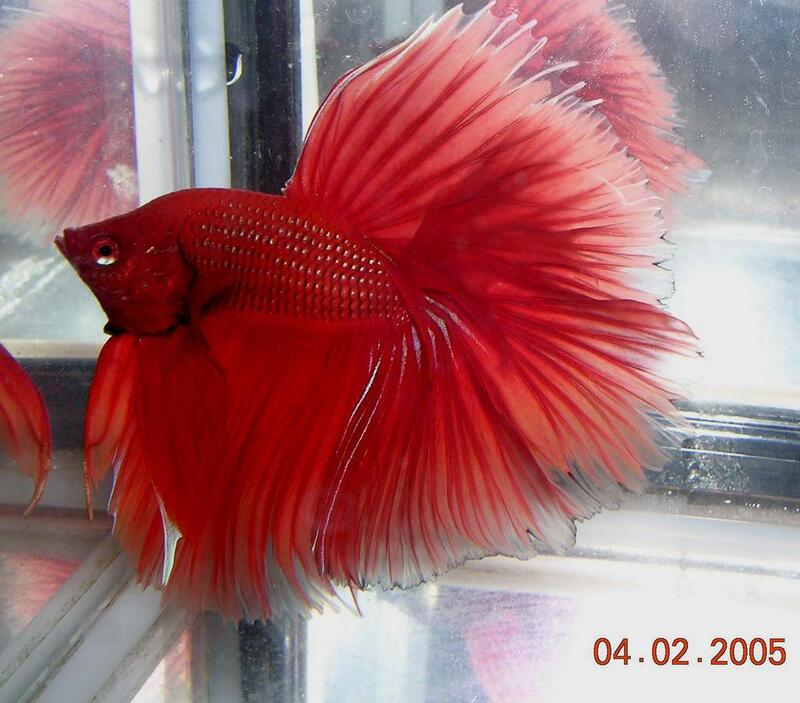 We ourselves have waded in, occasionally to catch blood worms for our fighting fish. We do this by running a metal wire through the sand. When the wire emerges, some blood worms will be found handing to it. We have also seen men with big cans and nets catching blood worms on a bigger scale. By the way, my teenage son who regularly goes for kayaking training at the Kallang River often jokes about the stench and filth. Wait till he reads this blog. The recent news about the Katrina Hurricane in US, reminded me of an incident concerning the Dead Chicken River. I saw a news report in CNN concerning the floods in New Orleans, where people were warned to be on the lookout for alligators. One year, there was widespread flooding in Singapore; and many of us were also warned to look out for a crocodile that had escaped from the crocodile farm in Lorong Chuan. 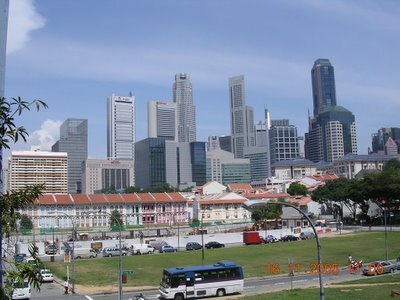 The location would be near the present junction of Ang Mo Kio Avenue 1 and Lorong Chuan. 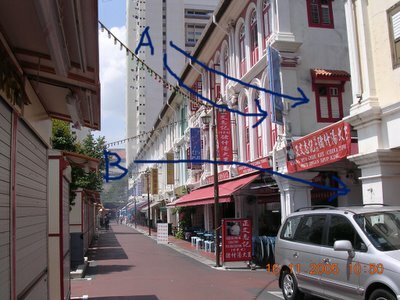 If you have been to Lorong Chuan those days, you will know what I am talking about. The stench from the crocodile skins can be detected from miles around. Below is a picture of our house. The design was quite unique. If fact, one year, it was featured in one of the primary school geography books. Our house was also one of the few houses that had a well. Before tapped water became available, many of our neighbours came to our house to help themselves to the water which was probably of the highest quality in the whole village. The well was located just to the right of the photo. To the left of the picture was a very old durian tree with lots of dragon scales growing along its trunk. Before you start to envy us, I must tell you that this tree was really not very fruitful. 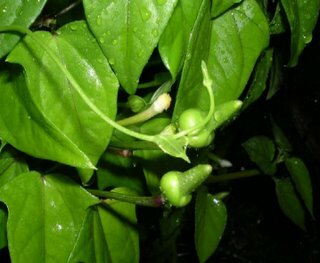 Each season it only bore a couple of very small fruits. Every time, the thud of the falling durian was heard, we children would race each other to get to the fruit. Perhaps it was due to the scarcity of the harvest that our durians seemed to be especially tasty. This photo was taken using our very first camera - a Kodak Brownie. It must be taken around 1957 or 58 becaue I (the kid on the left) looked no older than 5 or 6. The drainage those days was quite bad. Hence there were mosquitoes every where. At night, we needed to sleep with the mosquito screen all around. Even then, when morning came, you can find yourself in the company of several swollen, lazy mozzies, which was why our screens tended to have patches of blood on it. Mosquito breeding was so rampant that we could easily catch mosquito larvae from the drains to feed the fighting fish which we caught from the nearby ponds. However, we never knew of anyone catching dengue fever. The main road, Lorong Kinchir ran in front of our house and across the road was a row of 4 shops. Shop No. 1 (from the right) was a coffee shop. 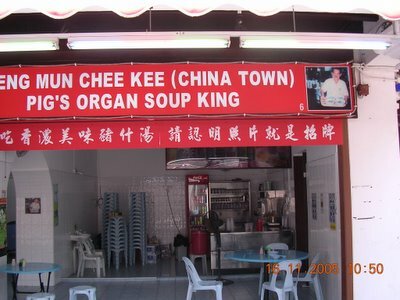 The owner was called Hock Chek (Uncle Hock). He was in fact my godfather although he hardly ever spoke to me. I was much closer to my godmother though (Hock Chim). Sometimes, I would volunteer to buy coffee from them. Those days, 1 big mug of kopi-O cost 10 cents. If my godmother was on duty, I usually get to pocket the 10 cents. I can recall some interesting things about the coffee shop. For example, they used saw dust to keep the ice blocks from melting. Occasionally, they also roast their coffee beans in front of the shop. The coffee beans were mixed with butter and roasted in a cylindrical drum which was rotated by hand. The aroma reached even to our house. On rare occasions, we gave ourselves a treat to a bottle of Pepsi-cola here. We liked to add lots of salt from a small Brand’s essence of chicken bottle, and listen to the sizzle as the salt crystals hit the cola. The taste was so wonderful that I promised myself that some day, if I could afford it, I would drink Pepsi everyday. Of course that was one promise I did not keep. Shop No. 2 was a provision shop owned by a man called Tua Tau (big head). We bought much of our foodstuff from him on credit. Whenever, we buy something, we would bring along a small 555 booklet (I think you can still find those today) to record the amount and the shopkeeper will also record in his ledger. It was then that we learnt how to recognize special Chinese characters for numerals (different from the normal Chinese writing). Shop No. 3 belonged to a guy called Ah Goo (buffalo). I can’t remember what they sold, but I certainly remember the multi-colour ice balls that we loved. I think he also sold sweets and other snacks. One sweet I remember was the coconut sweet. Sometimes if you were lucky, you can find a sweet with a 5-cent coin embedded to it as a mystery prize. I believe Ah Goo’s family were Teochew. I think he was quite a handsome bloke who attracted the attention of some of the village lasses. Our village were mostly Hokkiens. We were about the only Cantonese family; until my 7th Uncle moved in with his 9 children. After that, our standard of English improved tremendously, but our Hokkien deteriorated. I am not sure why my father chose this place and not Potong Pasir which was predominantly Cantonese. I think my eldest brother would know. Shop No. 4 was a barber shop. The owner was a very quiet guy. His family kept very much to themselves. I believe they were Hock Chew. They were probably Catholics because they had a portrait of Jesus Christ hanging on the wall. Every afternoon, we would go over to borrow the Chinese newspapers from him so that our brother David could read to us the 武侠 stories. David’s Chinese was the most kilat of the lot. One year, he got a book prize for topping the whole level in ACS in Chinese. The title of the book was 中国名人故事 - Stories of famous Chinese personalities. I learned about 李白 and 白居易 's immortal poems from this book. Shop No. 5 was on our side of the road facing Shop No. 1. It was a small coffee shop with attap roof and no walls. We called the owner Fook Chow Lou (Hock Chew man). I often bought snacks like tau sar piah from him. 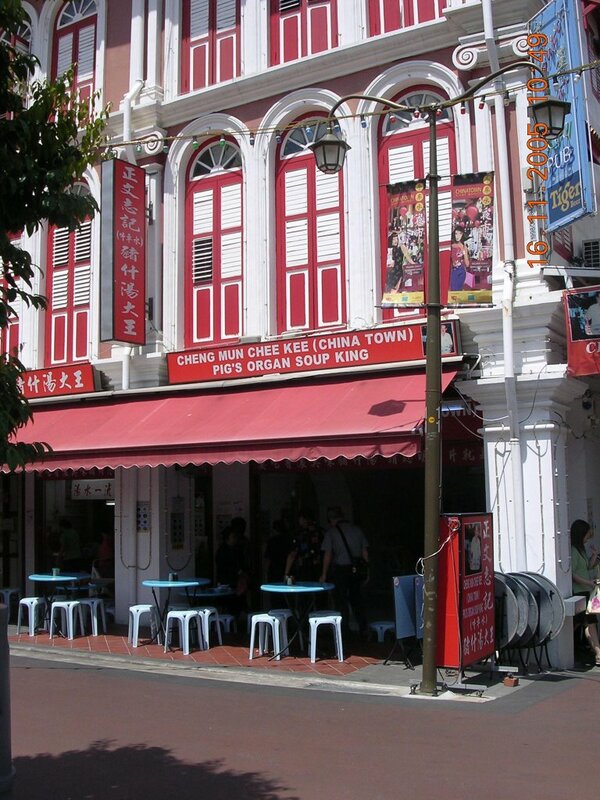 At one time, there was a stall beside this selling You Char Kueh (You Tiao). We enjoyed watching the man prepare the you tiao. From the picture above, you may also be able to make out the public toilet located next to a pond (please refer to sketch above). Did you know that we made our deposits directly into the pond! Well that’s all I have to tell you about the village my siblings and I grew up in. The next time you travel on the Central Expressway from Ang Mo Kio towards Braddell Road, look to the left and try to picture the kampong we called Chui Arm Lor. I hope you enjoyed reading this blog. If it stirs up some fond memories for you, please share them with us. I also have some good news for you. 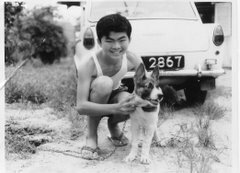 I managed to persuade my old friend Tan See Jong (Safti Lima & Romeo coy, 1971) to contribute an article about his childhood surroundings in a place call Genting Lane. Look out for it. Reach out for the joy and the sorrow. To spend when you get till tomorrow.